13 Above: Is This The World's New Tallest Man ? At 8ft tall, Zhao Liang stands head and shoulders above the competition. Which is lucky, as the 27-year-old is in the running to be the world's tallest man. 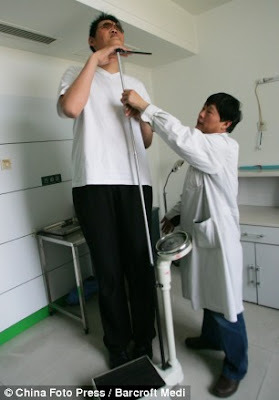 The current title holder is Bao Xishun ('the Mongolian mast'), who measures in at a measly 7ft 9in - a whole three inches shorter. Mr Liang's claim came to light when he was admitted to Tianjin hospital, in China, for a routine operation on an old muscle tendon injury to his left foot. Doctors confirmed his height as 8ft 0.7in. But his claim to be the world's tallest man has not yet been verified by Guinness World Records. Mr Liang, who is now seeking official recognition, had been training as a basketball player when he sustained the foot injury over a decade ago. He remained unemployed until 2006, when an art troupe in Jilin province employed him to perform magic tricks and play the saxophone and flute. 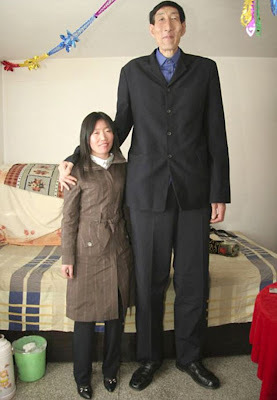 Mr Liang's parents are of normal height, with his father measuring 5ft 9in and his mother, 5ft 5in. Hospital staff confirmed Mr Liang's height. He is now seeking official recognition from Guinness World Records. His mother Wang Keyun said that her son had a big appetite, eating eight hamburger-sized steamed buns as part of a three-course dinner. 'But I am so worried about his marriage, job and his health that my hair has turned white,' she added. Liu Yuchen, a surgeon at the hospital, declared the operation on Mr Liang's foot a success. Mr Liang currently works with an art troupe, performing magic tricks and playing the saxophone and flute. He said that he would be able to walk normally in two months' time, but advised against any intense physical exercise. Dr Yuchen said that Mr Liang was in good health and has no complications in relation to his height. 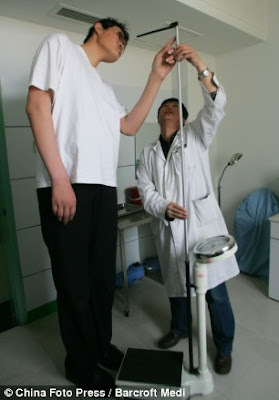 The world's current tallest man is Bao Xishun, who stands at 7ft 9in. 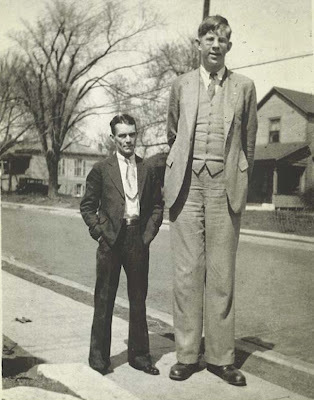 Robert Wadlow (1918-1940) - the tallest person in medical history for whom there is irrefutable evidence. But no one has quite reached the dizzying heights of the tallest man in medical history - Robert Pershing Wadlow from Illinois, US, who stood at 8ft 11.1in.